Joe Servello and I go back quite a ways. We are high school friends and former neighbors who's fathers instilled the passion in us for the great outdoors. Joe and I spent many an hour hunting, fishing and trapping together in our youth. 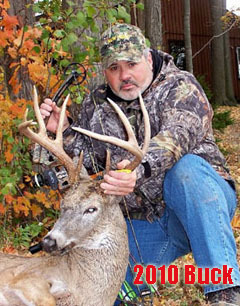 So it only seems fitting that I contribute a neat tale of two bucks taken in two consecutive archery seasons, " Not to the Day but to the Minute. " Last season I had a chance to finally sit in a stand that I had hung at the end of the 2009 season. I had two stands east and west of this location and it would have been easy to pick off several nice bucks I had been hunting with a firearm from these east and west stands. However with a bow 50-60 yards is out of the question for me. The deer always seemed to hug the ditch line that bisects a former 200 acre property that I hunted before my friend and land owner Clifford Stich DDS. passed away in April 2001. The stand I had on that property produced several nice bucks. Now I hunt in a club in which the land owner has 2000 acres my new stand is about 30 yards off the property I once hunted and in that ditch line up in a tree about 23' high in between a field of corn and field of soy beans. Talk about a funnel! On 10/15/10 I took that stand before sunrise. As soon as I hauled my bow up I could heard a buck chasing a doe and grunting quite loudly. I thought to myself, "Holy cow is this really the first day of archery? ", as I usually don't have this kind of stuff happening until around Halloween or after. As the sun rose the game continued, it turned out to be a big bodied 4-pointer not giving up in his quest. I saw deer on and off every hour up until 9 a.m. then a red fox came in from behind my stand giving me a shot... a shot that I missed. There isn't a big target there under that fur. With a morning under my belt I climbed down around 10:30 and headed to the Magee Diner for lunch. With so much activity that morning I couldn't wait to get back up in that stand so at 2:30 on 10/15/10 I was in that stand. Nothing really happened until around 4 p.m. when that 4-pointer entered the bean field looking for love once again. He and several does milled and munched on beans for about a half hour. Then slowly faded back into cover. I sat there for about another hour letting birds, squirrels and mice entertain me while I snacked on apples, cheese curd and gator-aid. I stood from my sitting position around 5:30 we were now in the witching hour. At 5:35 a nice buck stepped out of the woods about forty yards away to the north west looking into the standing corn. Immediately I said to myself "shooter". Except at this point there was no shot. I didn't have a grunt tube nor doe bleat out and thought he would walk to the west over the drumlin into the woods where the does like to hang. So I made my own little doe bleat vocally and low and behold he started coming my way. He stopped directly in front of me standing in the ditch with water up to his belly looking into the bean field for that doe he thought he heard. He would not budge for what seemed like an eternity, but was only minutes. Finally he turned back came out of the ditch and offered me a 20 yard shot. I released and hit him at 5:45, but was disappointed with my shot as it was further back than I wanted. He bolted back into the woods and I had a sleepless night waiting to recover. 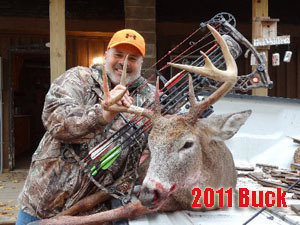 I did recover not more than 70 yards from where he was arrowed that morning. Fast forward to 10/28/11 I was in the same stand before sun up, two fawns from this year showed up at about 8:00 a.m. and mowed down some corn right underneath my stand where I was taking pictures of them. Not much else happened that morning so I climbed down at 10 o'clock. I had to run home to let the dog out, hit the bank and post office, then get back to the hunting grounds to hang a stand where I had found some buck sign before I left that morning. I got my stand hung and was sweating like a stuffed pig. I cleaned up with scent wipes the best I could and relied heavily on the northwest wind to conceal me from my quarry. I will only hunt this stand with a NW or W wind. I was a little behind in getting back up around 3:45 p.m. Around 4 p.m. those two fawns along with a spike buck came out into the cut corn field. To the east there is standing corn on the other side of my ditch stand. The spike worked his way from east to west and ended up directly under me where again I snapped away taking pictures. I sent one to a friend from my phone letting him know I was at least seeing deer. His reply to me was that Big Daddy sent them out ahead. I chuckled and put my phone away. Once again it was around 5:30 the witching hour. No sooner did I stand from my sitting position when Big Daddy stepped out from where the little ones were. He came out of the woods about 15 yards into the cut corn and surveyed his situation. I said once again to myself "shooter". But at 80 yards not so. I also noticed a deer at about 130 yards away standing over a scrape that I had seen on my way back to the car that morning and I said to myself s**t! He was looking right that way and I figured that would be his destination. However he slowly made his way east to west right where the spike had come over an hour or so ago. Now my heart was pounding just a tad. Then when he was about 35 yards out he started to turn south which would now bring him along side of my stand. I slowly drew and anchored I had my twenty yard pin on him as he was right along side of me. But, I had a little fight going on with the harness belt that is part of my vest attached to the tree but was able to get my arm on top of it so it wouldn't interfere with the shot. Now I let that little stopping grunt out which did the trick! There he stood, approximately 20-22 yards away, looking at the base of my tree. I let the arrow fly and stuck him right behind the shoulder I did not get a pass through because I think he may have been at a slight angle, but that arrow was buried deep. In the blink of an eye he covered 80 yards back to the spot where he entered the corn field. I grabbed my phone to call my friend and the time 5:45 I couldn't believe it. Again I decided not to recover until the morning as it would be clear and cold all night. The next morning the recovery was made on a blood trail that was obvious and about 180 yards from where he stood the night before. The investment I made in a new bow I bought this past spring was worth every penny and the practice, practice, practice, PRICELESS! Thanks for letting me share and good luck to everyone in pursuit!